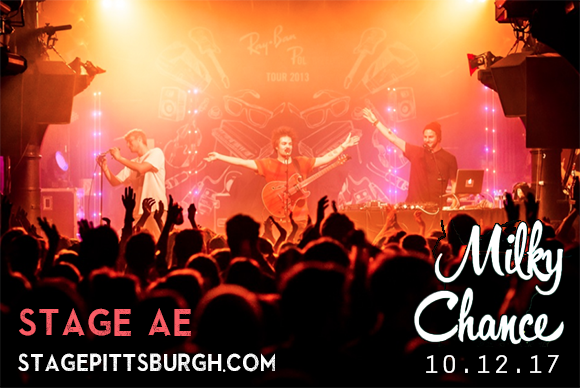 Milky Chance are coming to Stage AE on Thursday 12th October 2017! The amazing Milky Chance are hard to categorize with their sound that stretches across genres but one things for certain, their music has universal appeal. With their gentle singalong melodies, house infused beats, rhythmic guitars and plenty of hand claps for crowds to get involved in. As they hit the ball running back in 2013, they released their debut album 'Sadnecessary' which included the huge anthem "Down By The River" which brings to mind of fellow folk acts such as Mumford and Sons, Lumineers and Edward Sharpe & The Magnetic Zeros. Peaking at number 14 in Germany, it wasn't long until their songs where taking towards a more global success. After a TV debut on Jimmy Kimmel Live, American fans can't get enough and now in 2017, Milky Chance are touring across the US – if you get the chance, don't miss them as they perform at a venue near you!